It’s time for the Virtual Book Club. Each month a different author is featured. Everyone participating then selects a book by the chosen author and creates an activity to accompany the book. The featured author for March is Julia Donaldson. I have to admit this was a new author for me. There were a number of books for us to choose from and we finally landed on The Snail and the Whale. 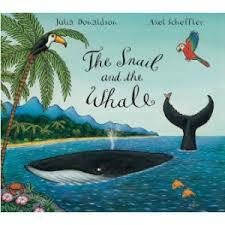 The Snail and the Whale is a rhyming tale about a snail that sets sail with a whale. They see many sights along the way including penguins, a volcano and a bear. Along the way, the whale becomes beached and the snail sets off to save it. After being rescued, the two return to the other snails and gather them to take along on another journey. My son fell in love with this book. His favorite part was when the firetrucks came to spray water on the beached whale. To extend the story, we decided to create a snail and whale sensory bin. Utilizing sensory bins in this way allows children to act out the story and expand on it. Both comprehension and language skills are developed during this play. There were many other characters and setting props that could have been utilized. I just used what I had on hand and the things that interested my son the most. Other optional items that would work well with the story include: volcano, bear, boats, birds and trees. Have you used sensory bins to extend stories? This was our first time. I’d love to gather more ideas. Please share below in the comments. Below are other wonderful bloggers who have also selected a book from the featured author and created an activity to accompany their book choice. Please visit each one! Also, link up your post about your favorite featured author book too. Thanks Kim, I’ll try to make it to the hangout! I love this series! What charming activities you came up with for such a lovely book! 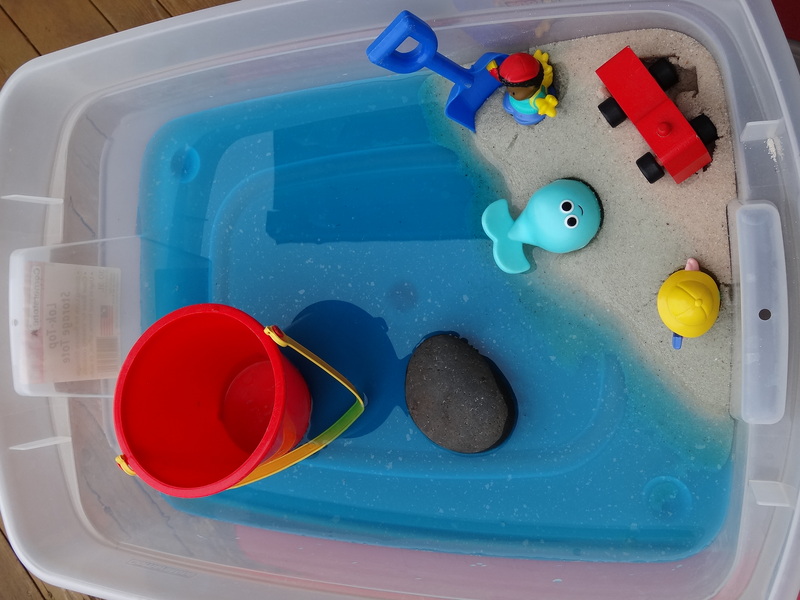 All the elements of fun for kids: water, sand and toys!! Thank you! My son has been enjoying the literacy box and book everyday since we’ve created it.